Enthusiastic Congress workers took to the streets to celebrate the arrival of the two new AICC incharges, with party tricolours and hoardings all over giving the city a festive look. Since early morning, Congress workers were seen busy giving final touches to the arrangements for the roadshow, distributing food packets, tea and water to passersby. Patriotic songs were played on loudspeakers perking up the mood. Some posters showed Priyanka in ‘Durga Mata’ avatar riding on a lion. 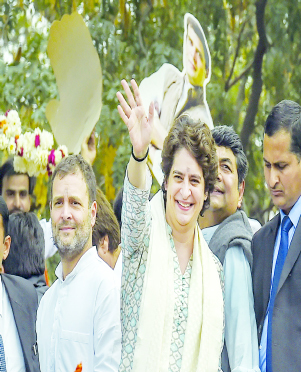 Besides workers of other front organisations of the party, some Congress workers — said to be members of Priyanka sena, a little known outfit — were seen wearing pink T-shirts with her photograph. “With the Priyanka Sena at the Nehru Bhawan, Lucknow it is almost celebration here,” tweeted Sushmita Dev, president of all India Mahila Congress.